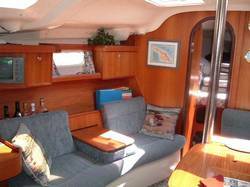 LOA: 37' 4" LWL: 32' 0" Beam: 12' 7"
This Hunter 376 features a very spacious interior that is airy and light. 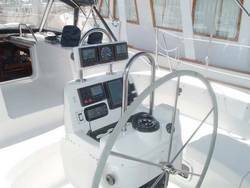 It offers great cross ventilation from fourteen overhead hatches and opening ports. The amenities on board make for comfortable short and long distance cruising. 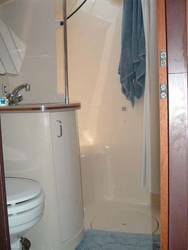 Forward is a private stateroom with a large V-berth, seat (great for putting on your shoes), hanging locker, shelves and a vanity and sink. The centerpiece of the salon is the dinette that comfortably seats 5 or more around a beautiful varnished teak table. 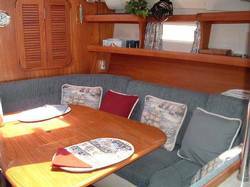 The table lowers to form a double berth for your additional guests. 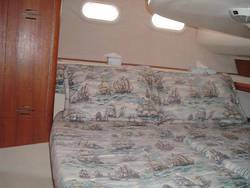 On the port side is a settee that will also sleep an additional person. 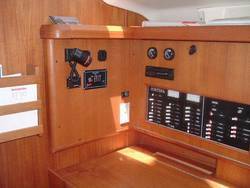 Aft of the settee is the outboard facing chart table with it's own stool. 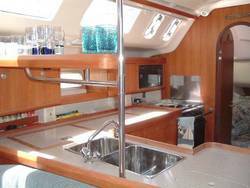 Opposite the chart table is the galley with it's capability to prepare everything from a snack to Thanksgiving dinner. 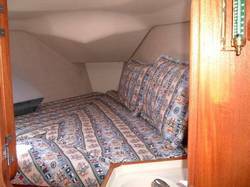 The master cabin runs the entire width of the boat and has an oversized double berth with lots of hanging and storage space. There is a seat and standing headroom. Just forward is the head with private access from the aft cabin plus access from the salon. There is a separate shower big enough to take a "real" shower in. The galley is a chef's dream. Plenty of storage and countertop space for food preparation and a separate freezer. Can't ask for more than that at sea. Adler Babor super cold machine cools both the refrigerator box and separate freezer box. The Hunter 376 uses the B & R rig which features a fractional rig 110% genoa and a large main with a roach top. 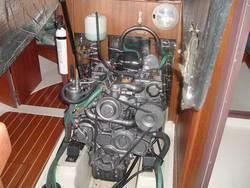 The genoa becomes the set-up sail for the main which supplies the power. The rig is easy to handle and sails well to all points of sail. 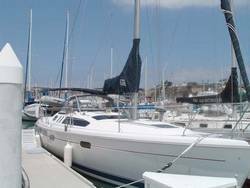 Contact Heritage Yacht Sales & Charter Co..
copyright � 2004 boats.com, Inc. All Rights Reserved. Site photos copyright � 2004 Neil Rabinowitz.